A crisp beautiful fall day, and a piece of history share this view. The cannon - a relic from the Civil War is placed to recognize the efforts of the CSA North Carolina's Calvary Brigade that fired decisive blows against the North. 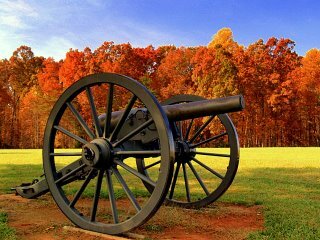 This action is recognized as the LAST BATTERY TAKEN at Appomattax by the Confederates. This weapon serves as a memorial honoring this fact.